I am really looking forward to this project, which should be a lot of fun! 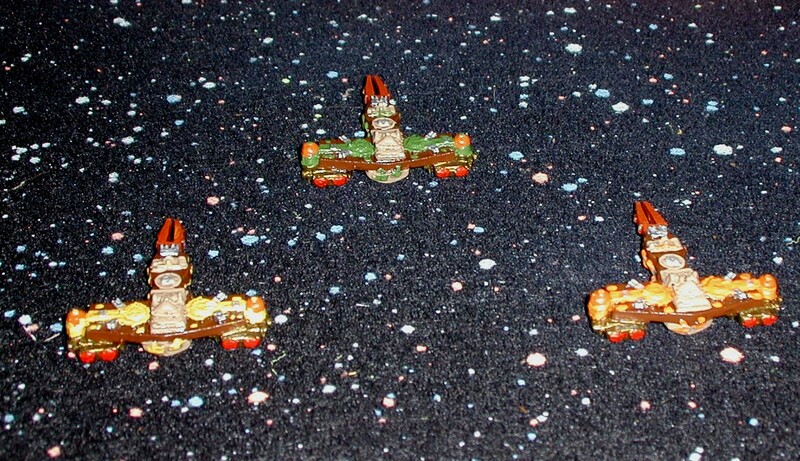 I'm be depending heavily on my friends from the Hartford Area Historical Gaming Society for help with terrain and setting up the many tables. 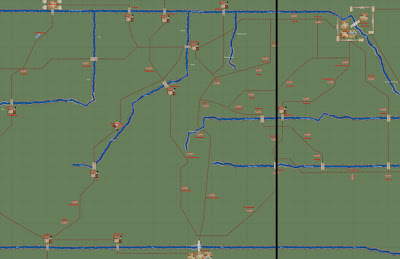 The game will be run at Ellis Con, on Saturday, November 17 , 2012 at Ellis Technical School in Danielson, CT. Planned time is 11 AM to 5 PM. More updates later. 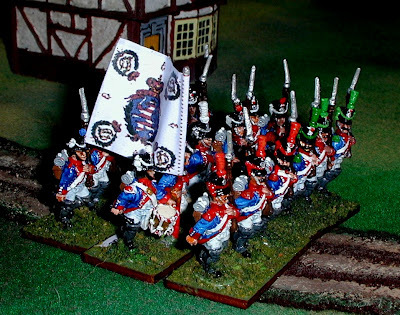 Most Americans are aware of the Hessian states of Germany, if at all, chiefly due to the employment of Hessian troops under contract to the British during the American Revolutionary war. It was troops of the Hessian contingent that Washington surprised in 1776 with his Christmas night crossing of the Delaware near Trenton, NJ. Hessian lands had been split into two separate, small states in 1567: Hessen-Darmstadt and Hessen-Kasel. While both states fought against Revolutionary France, their fates during the Napoleonic Wars were quite different. Both states were initially augmented in 1803, receiving territories from former Imperial free towns and small church states. In 1806, however, the newly elevated Kurfurst of Hessen-Kasel, Wilhelm I, displeased Napoleon when he partially mobilized his army as the war between France and Prussia began. Under the terms of the Treaty of Tilsit in 1807, Hessen Kasel was dissolved and its territories, along with additional; lands seceded by Prussia, were used to form the nucleus of the new Kingdom of Westfalia, which was given to Napoleon's brother, Jerome. Wilhelm returned to his lands in November, 1813, after the French were expelled from Germany following the battle of Leipzig. Landgraf Ludwig X of Hessen-Darmstadt wisely allied himself with France in 1806, joining the newly formed Confederation if the Rhine as a founding member in July of that year. As a reward, Ludwig was elevated to the rank of Grossherzog (Grand Duke), and Hessen-Darmstadt was further enlarged by receiving all remaining former Imperial possessions found within its (fragmented) boundaries. Its population at this time was probably about 600,000 persons. 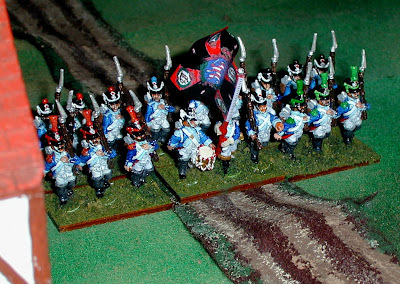 Hessian troops fought with the French in 1806 and 1807, generally earning a good reputation. Hessian reputations didn't fare as well when their contingent fought in Spain, but the men lived up to their reputation in the Danube campaign of 1809, being engaged in heavy fighting at Aspern as part of Cara St. Cyr's Division of Marshal Massena's IV Corps; Hessian troops also fought at Pressburg, Wagram (being involved in heavy fighting around Aderklaa), and Znaim. 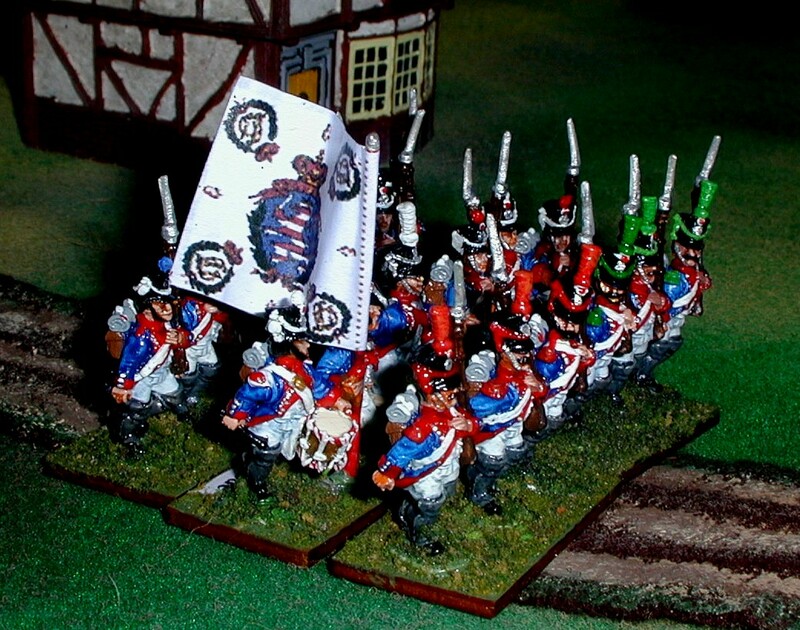 Troops from the Grand Duchy continued to fight along side the French is Spain, and also participated in the invasion of Russia in 1812, and the 1813 campaign in Germany, before passing into the Allied camp for the remainder of the Napoleonic Wars. 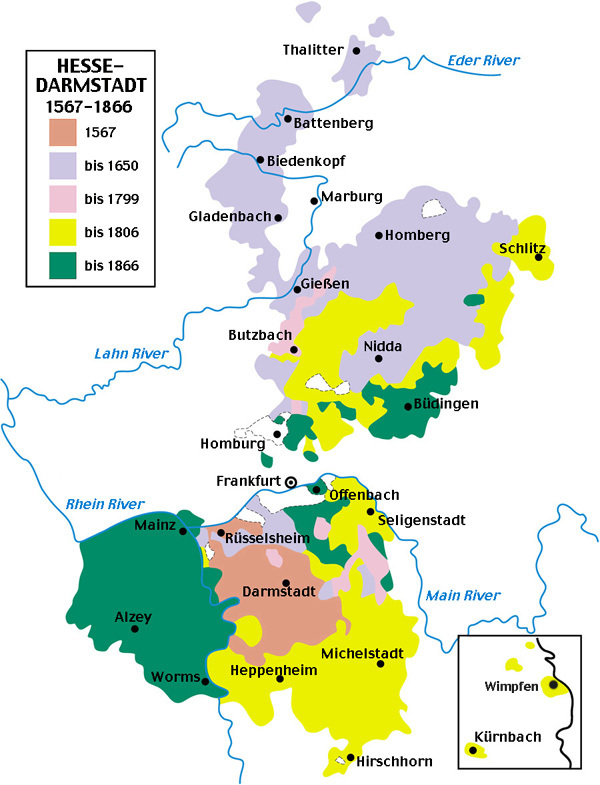 Map of Hessen-Darmstadt territories over time; the territories in green were added following the Congress of Vienna in 1815; other territories were lost to Prussia at that time. 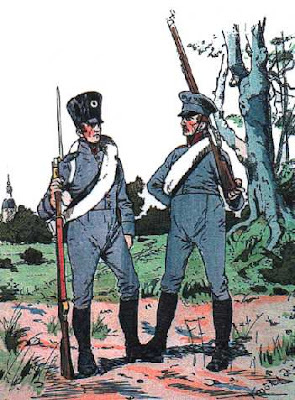 In 1806, the army of the Grand Duchy had three Infantry "brigades", essentially the same as regiments in most armies, each composed of 2 battalions of line infantry , wearing dark blue coats, and one battalion of Fusiliers (light infantry), wearing dark green coats. All battalions had four companies of about 120 men, which was increased to 170 men per company for the Danube campaign in 1809. In late 1808, the Gross und Erbprinz brigade, which fought in Spain, was reorganized along French lines into two 6 company battalions with one each of Grenadiers and Voltigeurs, and four center companies per battalion, all (eventually) wearing dark blue coats. It is unclear if or when the other brigades made the transition. The bicorne hat was worn until 1809; thereafter it appears the shako was adopted, bearing a silver heart shaped plaque upon which the heraldic striped Lion of Hesse was embossed. 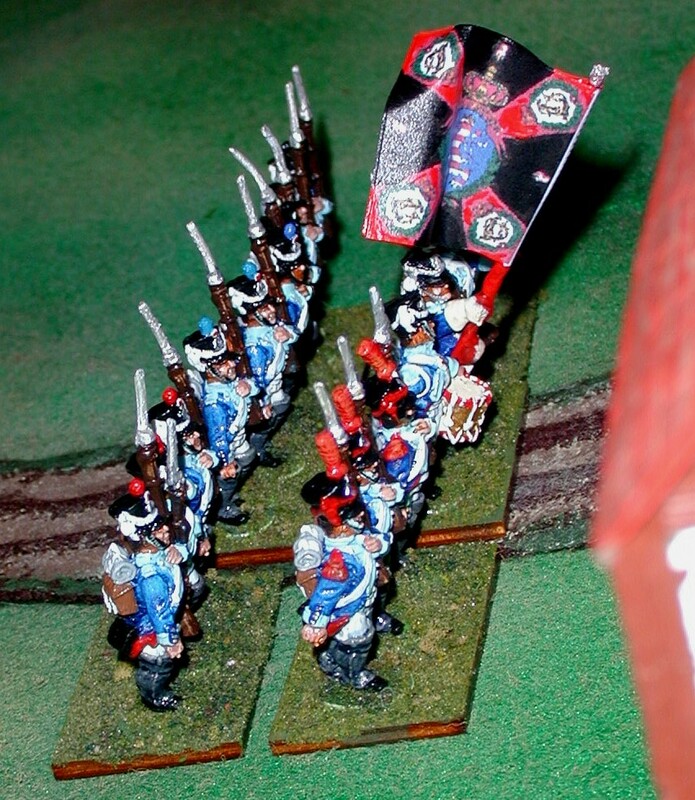 Gill states that the transition to shakos was made late in the 1809 campaign, but notes that the transition "was still incomplete when the contingent returned to Darmstatdt in January 1810". Breeches and crossbelts were white; later, blue pants may have been worn on campaign. All units had red turnbacks on the jackets, with the collar, cuffs, and lapels in the facing color. The Leib Garde and Leib regiments had white button hole lace on the cuffs and lapels; the other units may have had the lace as well. I am not aware of any 25/28mm manufacturer who makes troops specifically for the Hessians of the Napoleonic wars. For the uniforms up to 1809, I suppose 1806 era Prussians would be the closest fit. 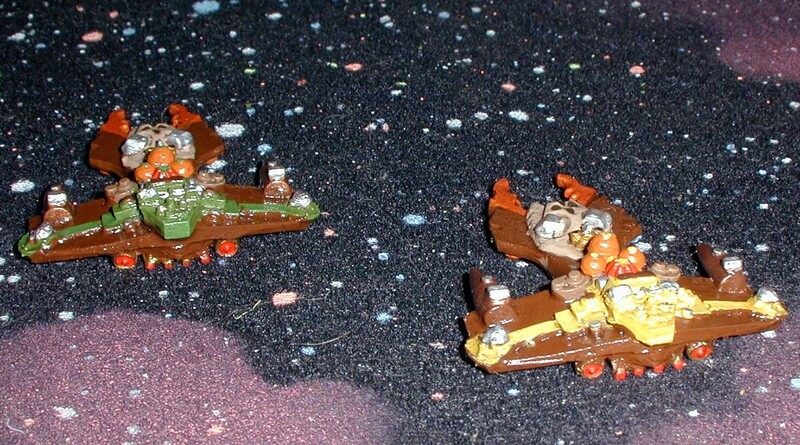 Of course, those two are in fairly short supply. 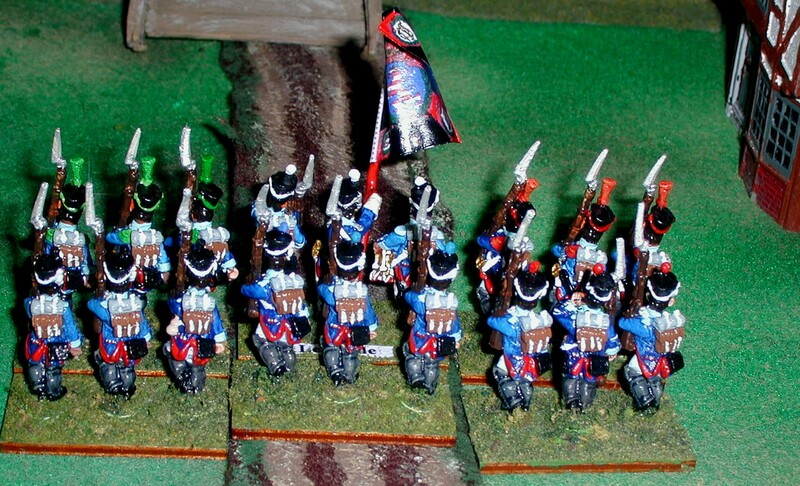 As a result, I chose to do my small Hessian contingent in the late 1809 and beyond uniforms with the shako, using Sash and Saber French line infantry figures. This is the Leib Garde brigade, with its red facings. Note the wings on the drummer, trimmed in white, and the red and white striped rims of the drum. On reviewing my sources, the officer's plume should probably be black with a red base instead of white; I will probably change this. I have chosen to assume, perhaps without justification, that the Hessian units remaining in Germany ultimately transitioned to the French organization as well - six companies with one each of Grenadiers (red plumes and epaulettes) and Voltigeurs (green plumes and epaulettes). This is implied in Von Pivka's Osprey Men at Arms #122 (see below). 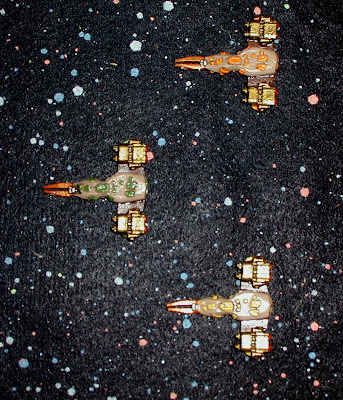 A somewhat blurry photo, but a clear image of the flag of the Leib Garde brigade. 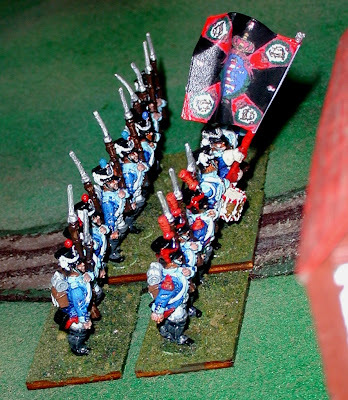 Each infantry battalion (but not the Fusiliers) carried two flags. In the case of the Leib-Garde, all four flags were the same as shown above, with an all white field. Flag is downloaded from Napflag. A rear view of the Hessen-Darmstadt Leib-Garde brigade; the red turnbacks are common to all units. This unit had silver scales on the chinstraps. 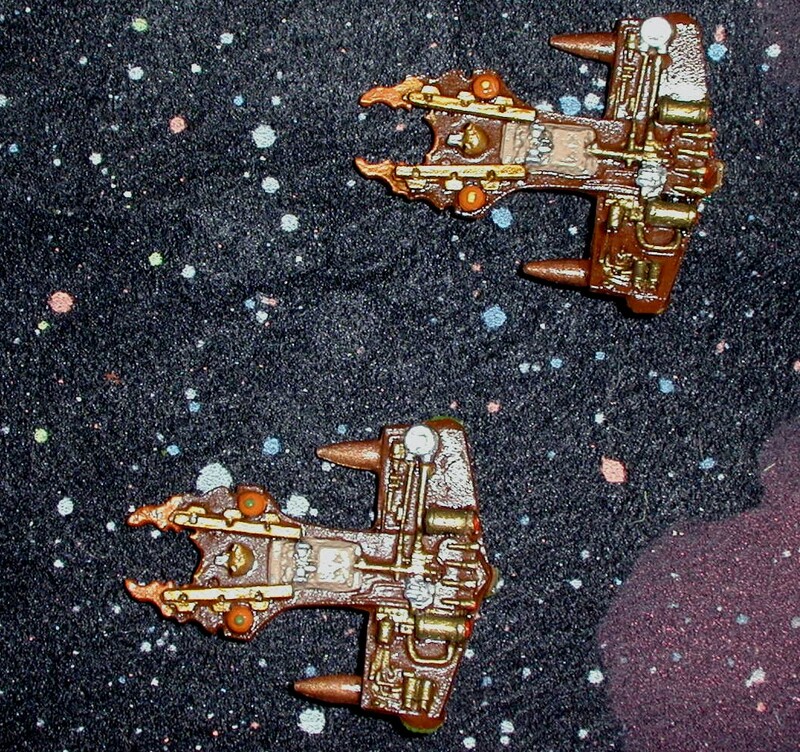 Next is the Leib brigade. This unit has light blue facings, which are a bit hard to see well in the photo. Black chinstraps edged with the facing color were worn by this and the remaining infantry units. 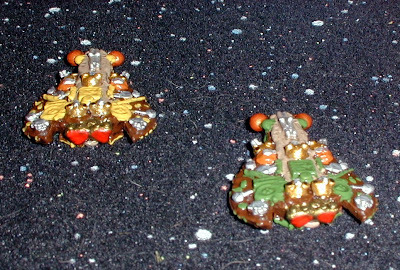 Rear view of the Leib brigade. The company pom poms for the first four companies were white, black, blue and red respectively, as seen here. This view best shows the light blue facings of the Leib brigade, which contrast much more cleanly on the actual figures; quite an attractive combination, I think. 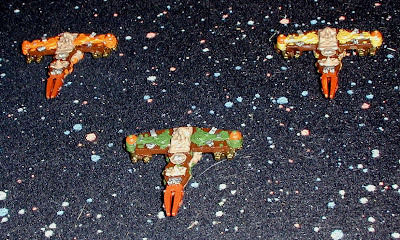 I originally painted two 12 figure Hessian units in December 2008, in preparation for our 1809 project at Historicon, using left over Sash and Saber figures. 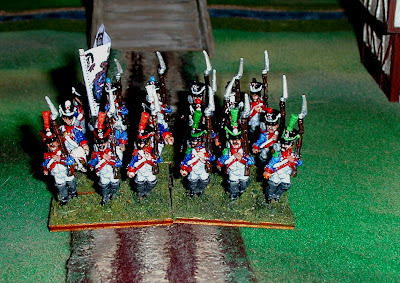 I finally had the time this month to flesh both units out to a full 18 figures (and add one of the glorious Hesse-Darmstadt standards to the Leib brigade, as seen above). Unlike the Leib-Garde, the other Hessian brigades had two different styles of flags; one Avancirfahne with a white ground, and three Retirirfahnen, with a black ground. 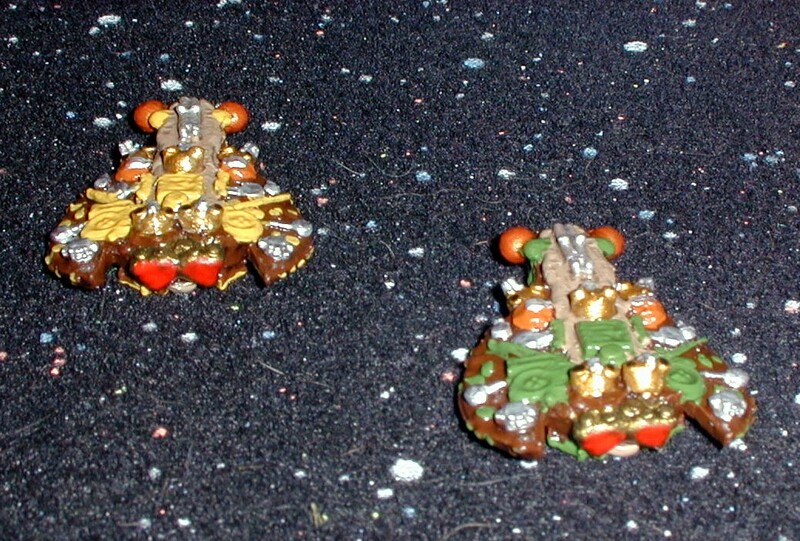 The first battalion of each brigade carried one of each, the second two Retirirfahnen. 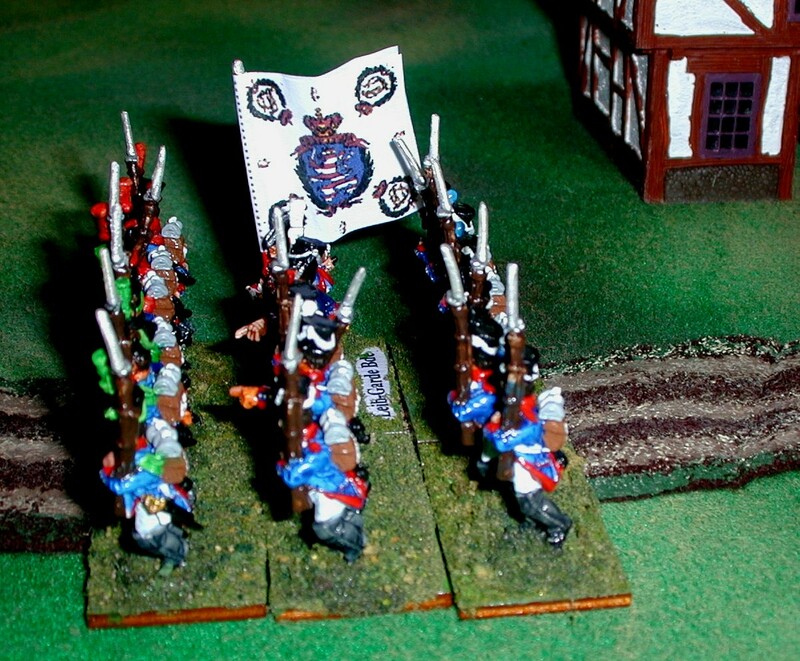 Later, this was reduced to one flag per battalion, with the 1st battalion carrying the Avancirfahne. 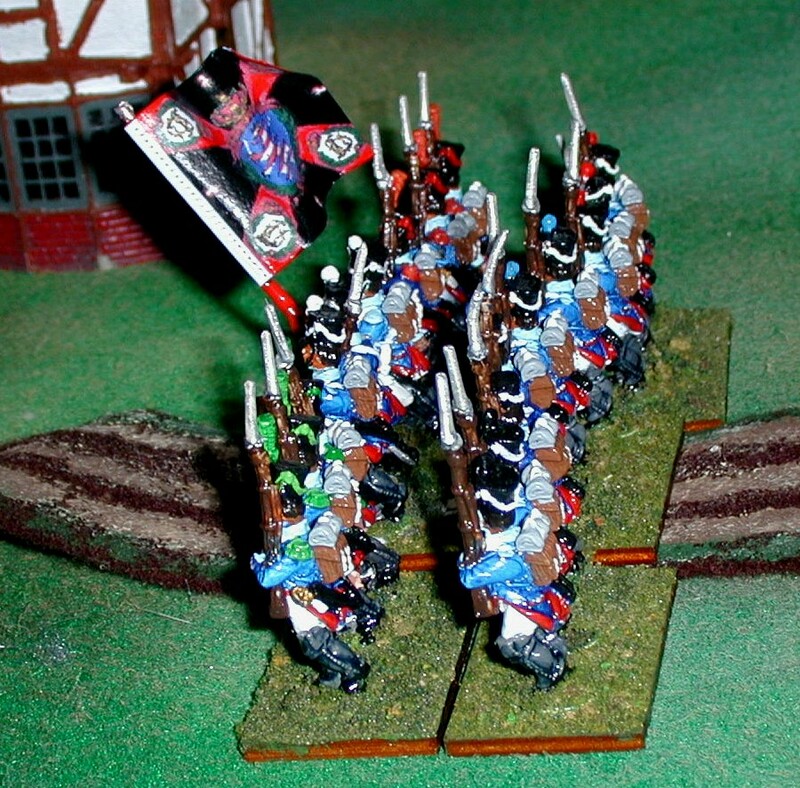 The corner rays on the Avancirfahne were half black, half colored (red for the Leib brigade, yellow for the Gross und Erbprinz), while the corner rays on the Retirirfahnen were solid in the same colors as listed. The central design was the same for all flags.The flag carried above is the Retirirfahne of the Leib brigade. I have deepened the colors of the red corner rays and black cross somewhat with paint. New flags were issued in 1814; these are shown (and available) on the Napflags site. 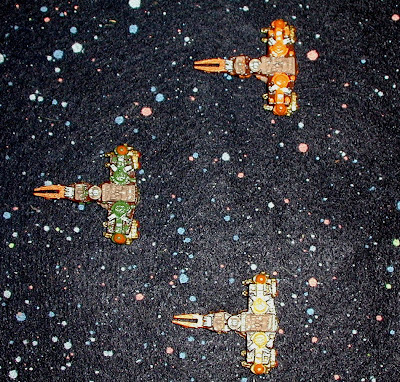 With Eagles to Glory, John H. Gill, 1992. Great book with a fine chapter on Hesse-Darmstatdt. 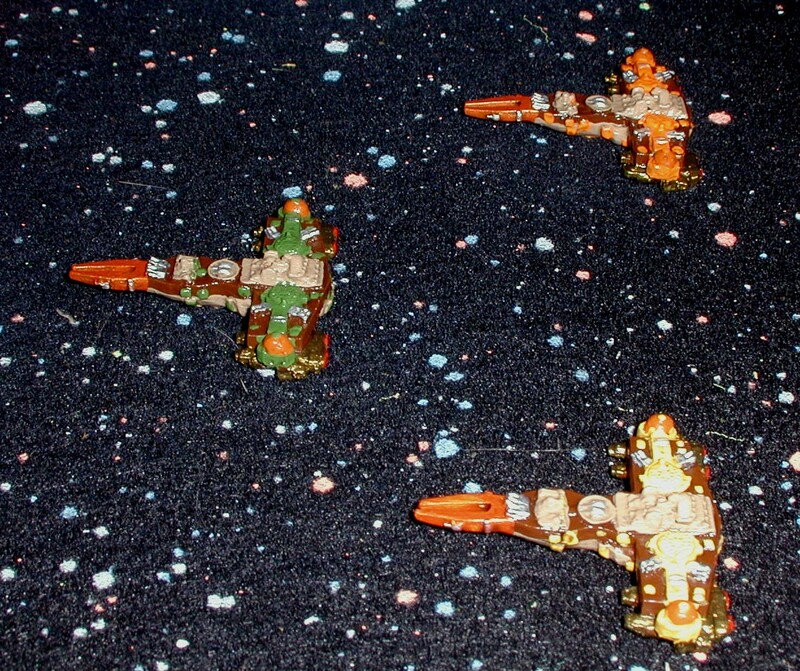 Napoleon's German Allies (5): Hessen-Darmstadt and Hessen-Kasel, Otto von Pivka, 1982. Uniformenkunde, plates and text by Richard Knoetel, 1890. Available online here. I hope you've found this survey useful. 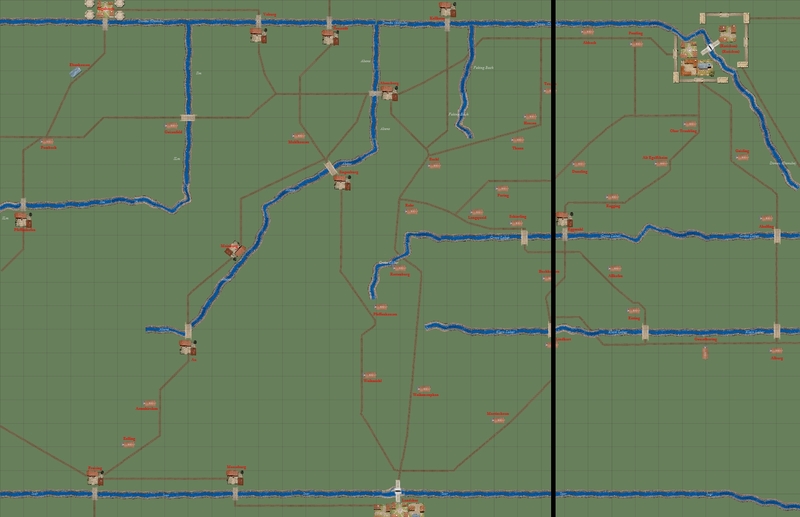 I hope to eventually add a Hessian artillery battery and their small Chevauxleger regiment to complete the force. As a closing note, Marshal Davout, not as man inclined to compliments, said of the Hessian performance in 1809, France "could not be better served than by these troops." ADDENUM October 30th: A few errors were brought to my attention, including the cosed lape;ls worn by Hessian units plus I wated to fix the chin strap/scales, officer plume clor, and I realized I left off the white button hole lace on the Leib Brigade. "Merciful Heavens, your highness, how can we possible go to battle without our Lace in place?" Prussian King activates Kruemper System! It is mid October, 1812, and the French army has been marking time in Moscow after their partial victory at Borodino the previous month. Czar Alexander shows no signs of negotiating with Napoleon, and the word is that a decision by the French to retreat seems imminent. Thinking that his opportunity to pay back the hated French Emperor for his humiliation and down-sizing of his Kingdom following the Treaty of Tilsit in 1807, King Frederick-Wilhelm II of Prussia quietly issues the instructions to begin recalling the cadres of trained men discharged from the army over the past 5 years under the so-called Krumper system. Still uncertain as to the eventual fate of the French army, he explains this as readying replacements for the Prussian Auxiliary Corps, that has been enthusiastically assisting the Grand Armee against the Russians; "Plausible Deniability", and all that! 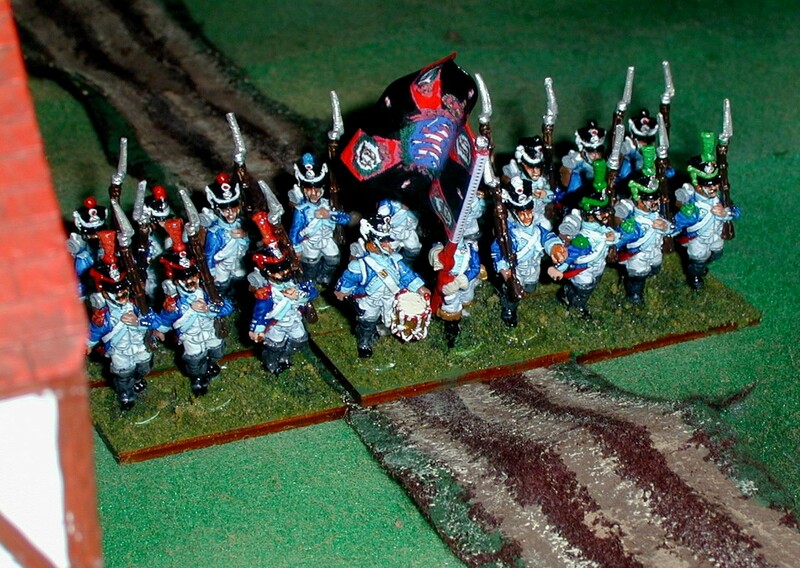 Thus the Prussian army is less than half the size of my Russians, and barely a third as large as my Austrian and French Armies. "Unzulaenglich! mutters der Koenig. 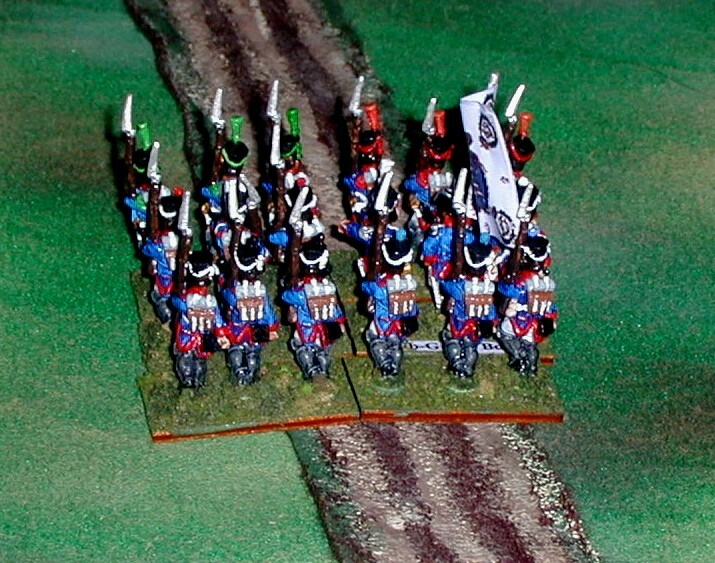 I'd like to have 1 Regular Line, 1 Reserve, 1 Landwehr, and one "special" unit for each Prussian "Brigade" (more or less equivalent to a Division in other armies of the time. The "special" unit may be volunteer Jagers, Schutzen, or Grenadiers. 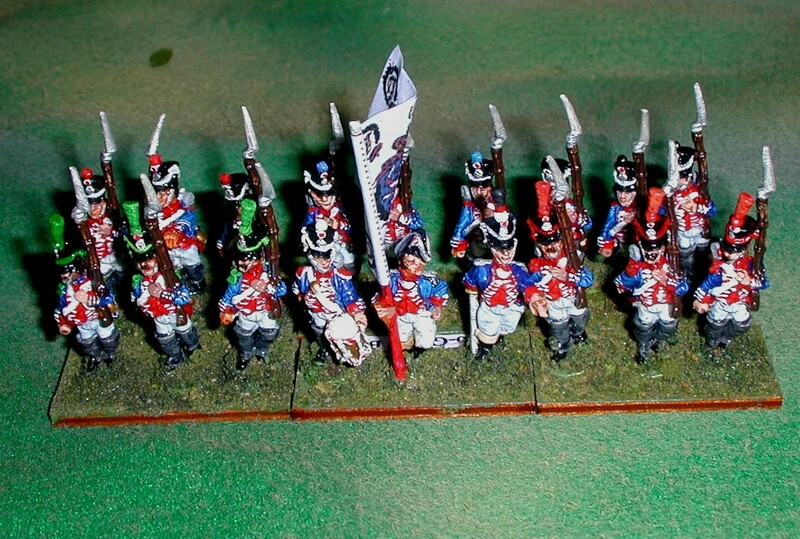 Thus I will need to add eight units of Reserve and four Landwehr; I'd also like to flesh out my small Grenadier unit to at least 4 stands (of three each), if not 6. 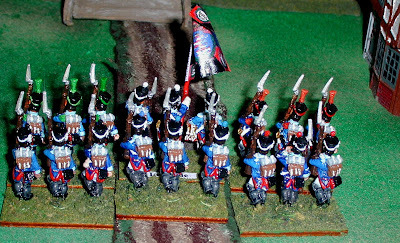 Finally, I have 16 figures of the Old Minifigs Prussian Guards with the tall, wide 'busch" plumes (found for me at a Historicon Flea Market almost 10 years ago by Joe), and will need to add a couple of command figures to round them out; these might come from Lancashire Games. I'll also need some more cavalry, especially Landwehr/National Cavalry regiments, and definitely some additional artillery units. That comes to $415, but with the 40% discount, just $249 plus the $50 for the Army Card or roughly $300 plus shipping and then I'll need some guns, which will be Sash and Saber. The investment in the Card is well worthwhile, as I plan on buying a lot of OG British before it expires, in preparation for our 1815 projects! For that, I'll get 180 infantry, 40 Artillery crew, 40 Cavalry, and 6 Generals - 266 figures! Hard to beat that. All the Cavalry will be in units of 8 (the extra 2 figures from each set will probably be used to make a really rag tag 5th (LW) unit, each stand with a different uniform style! Half of the Infantry units will be 12 figures, the other half 18 (I only need 12 figures per unit for Field of Battle) making 8 Reserve (including one in blue and one in a green "rifle" style British provided uniforms) and 4 Landwehr units. 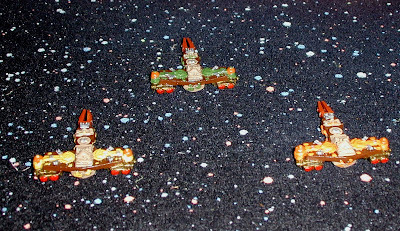 All the Artillery will be 2 stands of three, except a single 12# Foot battery, making six more artillery units. Some good sources for the varying and varied uniforms of the Reserve Regiments (which often varied by battalion) include The Napoleon Series, and an old Almark book (published 1972) on the Prussian APrmy of 1808-1815 by David Nash in my collection. The Osprey, "Prussian Reserve, Militia, and Irregular Troops 1806-1815 by Peter Hofshroer (Men at Arms #192), while certainly useful, IMHO wastes far too much space with the author's views on the "Kruemper System", a biography of von Gneisenau, and makes little attempt to convey much detail on the admittedly confusing topic of the uniforms of the Reserve units. Der Befreiungskrieg is about to begin... or at least painting for it! In the Starfleet Wars setting, the Entomalians have the most numerous fleet by far, but their ships are the least powerful individually. However, as the well worn adage goes, "Quantity has a Quality all its own! ', and no other power can com close to matching the overall strength of the Entomalian fleet. 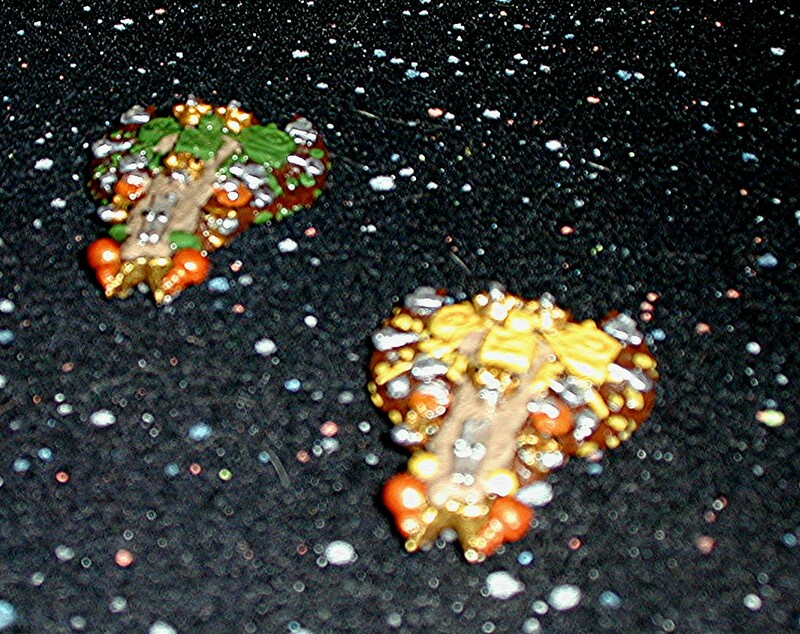 Described as being an insectoid race with a highly stylized caste system and probable telepathic mind control of the lower orders, the Entomalians are more or less constantly at war with all of the other factions. 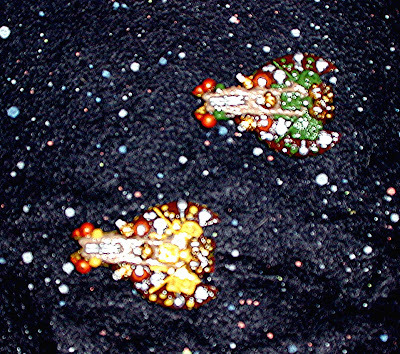 The Entomalians were originally collected by my long time friend, Chuck. However, he never really got around to painting them, and after many years of inaction, turned them over to me. It has only taken me another 16 years to get around to painting them myself, but I rather like the way they have turned out, which makes me want to expand the Fleet further, now that they are available once again as the Galactic Knights range (from Monday Knight Productions or The Panzer Depot). 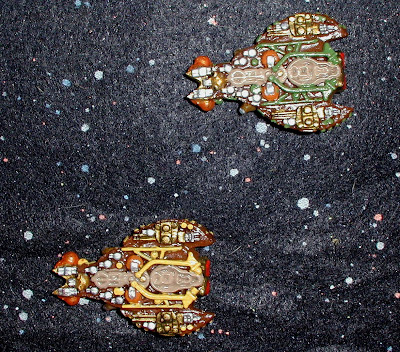 First I have to paint all the ships I already have, though! 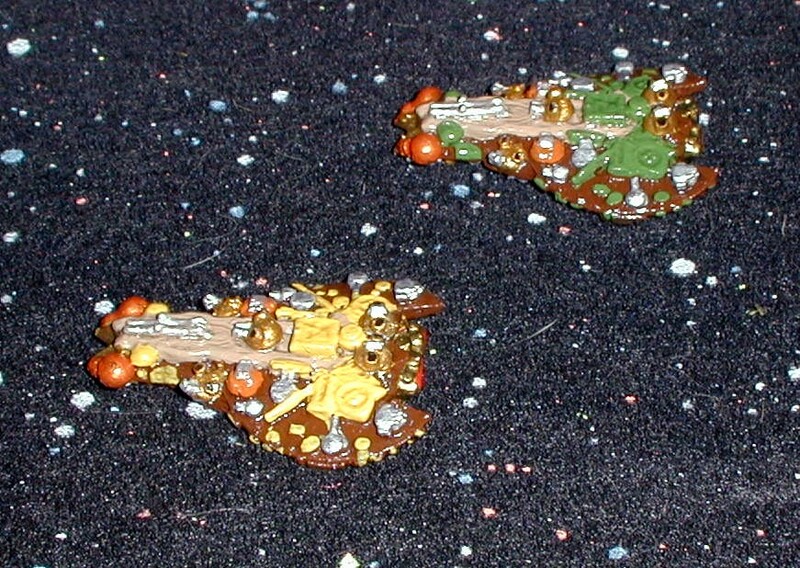 Here are the first lot, the workhorse smaller classes of the Fleet. 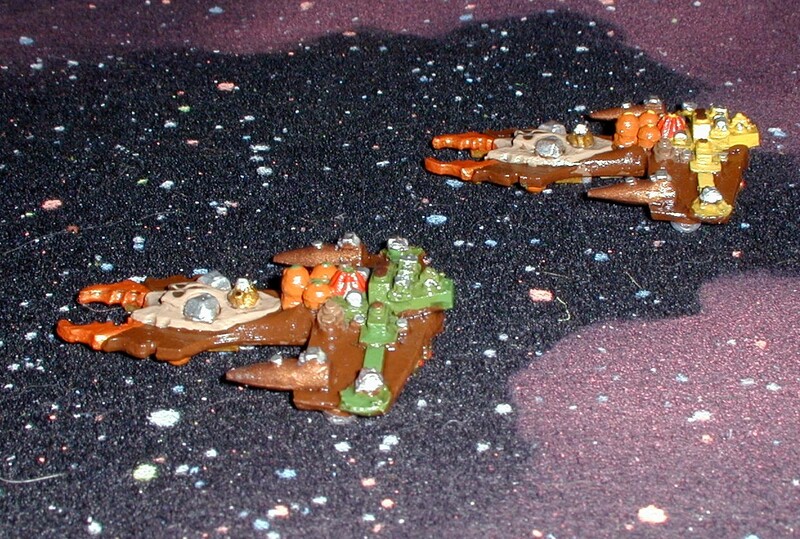 The Entomalian Fleet is distinguished by brown hulls... at least in my universe! 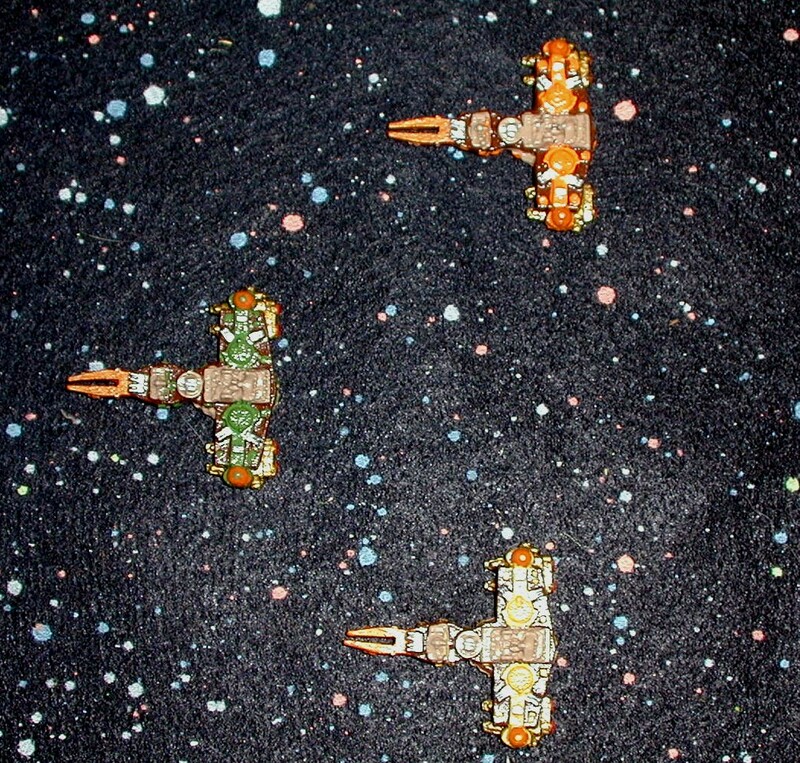 Each ship of the squadron has its own "facing color". The usual fine detailing on the undersides, characteristic of the line. 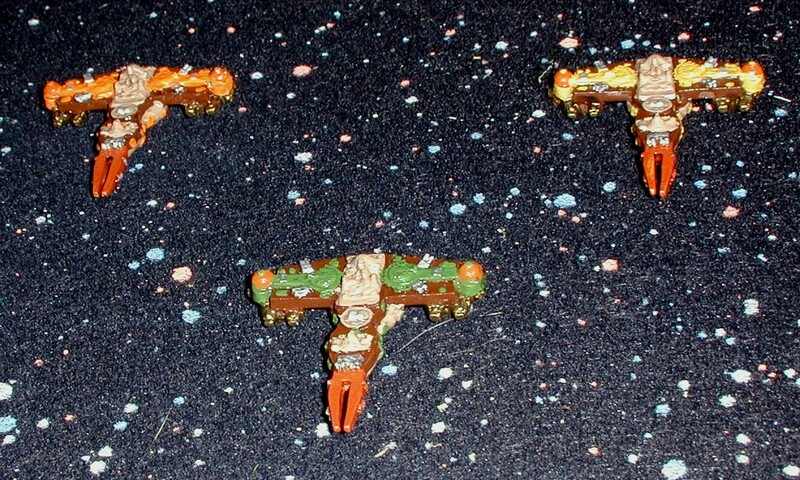 These are Entomalian Stellar Destroyer Leaders, released after the original set of five ships per faction. A blurry shot, but the amount of detail is still impressive. 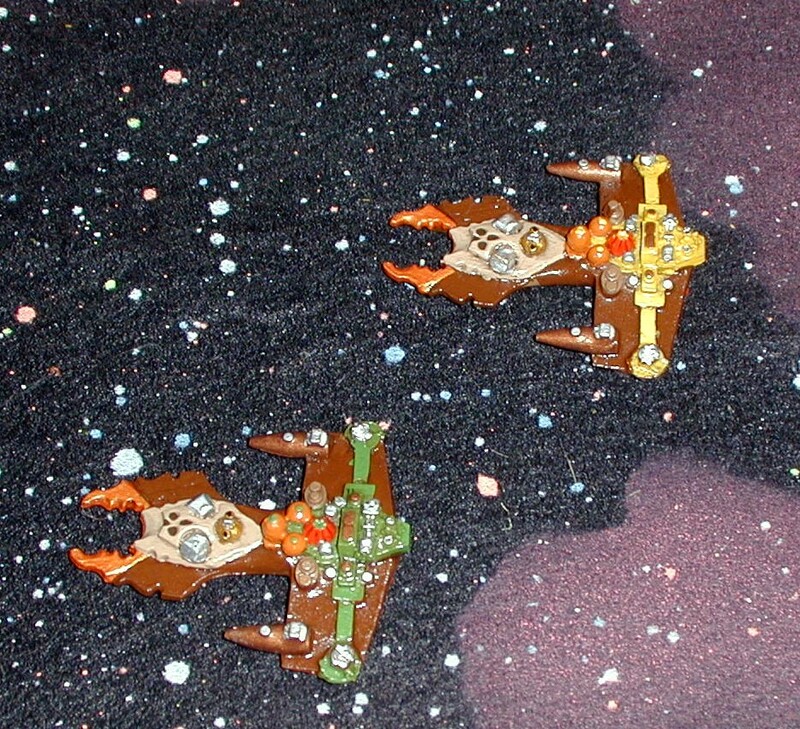 These particular models were among the last of the Starfleet Wars ships released. Once again, the undersides of the ships are just as heavily detailed as the tops sides. A pair of Entomalian Hornet class Stellar Cruisers. They actually look less heavily armed than the SDL's, don't they? Enemy spotted at 10 clicks, Sir! 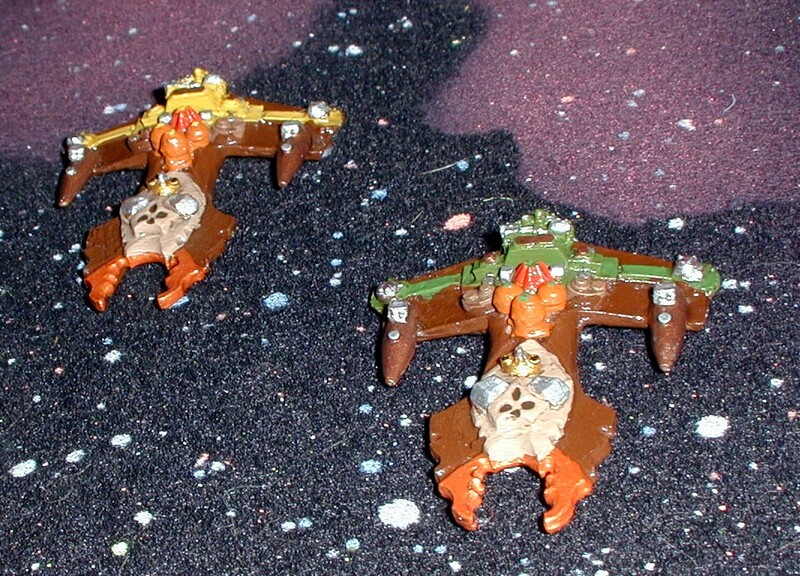 The insectoid inspiration for the ships remains very evident. Nice detailing on the undersides once again. On to the bigger ships of the fleet for my next group!